Our insulating rubber electrical safety switchboard matting are fully tested, stamped and certified to all European IEC61111, BS921 & American ASTM D178 standards. All Mats Direct rubber electrical switchboard safety matting carpet complies with all standards of quality and we supply letters of conformity and test certificates with each consignment FREE. Mats Direct have been successfully exporting electrical rubber switchboard safety matting to over 20 countries worldwide and we are recognised and trusted by many blue chip companies as a major supplier of electrical insulation matting to the oil, gas and shipping industries. They prevent electrical shocks whilst working on switchboard apparatus where the use of a high quality rubber safety floor mat is essential. 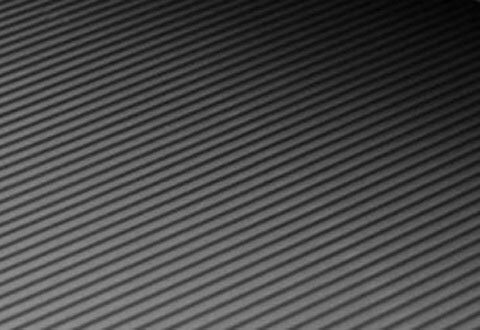 All the electrical rubber matting products within this section are vigorously tested to comply with the relevant standards and are manufactured using only the finest rubber compounds. Electrosafe electrical switchboard matting is tested and stamped to IEC 61111 Class 0. 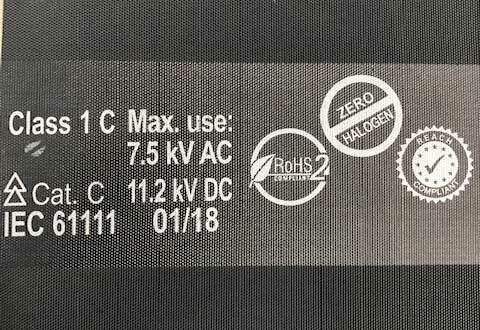 It is 7.5Kv tested and has a 7Kv working voltage. It is an extremely ultra high specification quality natural rubber compound safety matting product and is able to withstand the following: dielectric test 7,500v, surface proof test 5,000v, working voltage 1,000v. This is commonly used now as the replacement for the old BS921 specification 9.5mm thick electrical rubber matting product. Our range of insulating electrical mats ensures safety when working on high and low electrical voltage supply equipment. Available in 10m x 1m or 1.2m width rolls 3mm thick and can be custom cut to suit your requirements. Electrosafe electrical switchboard matting is tested and stamped to IEC 61111 Class 1. 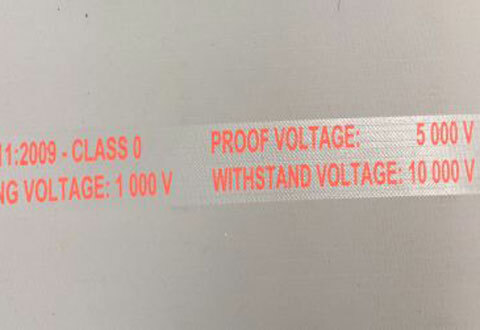 It is 15Kv tested and has a 7.5Kv working voltage. It is an extremely ultra high specification quality natural rubber compound safety matting product and is able to withstand the following: dielectric test 15,000v, surface proof test 10,000v, working voltage 7,500v. Grounding mats are ideal for working on live switchboard apparatus. Our range of safety electrical floor mats ensures safety when working on high and low electrical voltage supply equipment. Available in 10m x 1m or 1.2m width rolls 4.5mm thick and can be custom cut to suit your requirements. Electrosafe electrical switchboard matting is tested and stamped to IEC 61111 Class 2. It is 30Kv tested and has a 17Kv working voltage. It is an extremely ultra high specification quality natural rubber compound safety matting product and is able to withstand the following: dielectric test 30,000v, surface proof test 20,000v, working voltage 17,000v. They allow working on live electrical panels when carrying out essential maintenance in safety. Available in 10m x 1.3m width rolls 3mm thick and can be custom cut to suit your requirements. Electrosafe electrical switchboard matting is tested and stamped to IEC 61111 Class 3. It is 40Kv tested and has a 26.5Kv working voltage. It is an extremely ultra high specification quality natural rubber compound safety matting product able to withstand the following: dielectric test 40,000v, surface proof test 30,000v, working voltage 26,500v. 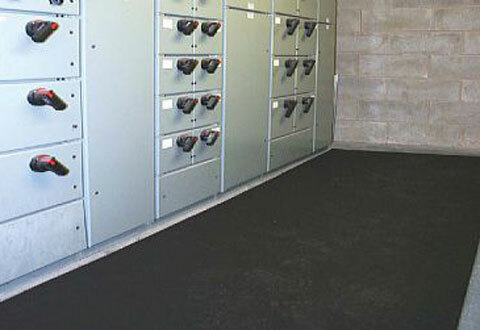 The matting is a high quality rubber matting for electrical switch rooms and is vital in maintaining safety during any operation being carried out on the switchboard equipment. Available in 10m x 1m or 1.2m width rolls 3mm thick grey colour and can be custom cut to suit your requirements. Electrosafe rubber switchboard safety matting is tested and stamped to IEC 61111 Class 4 specification. It is 50Kv tested and has a 36Kv working voltage. It is an ultra high specification quality natural rubber compound safety insulating matting product able to withstand the following: dielectric test 50,000v, surface proof test 40,000v, working voltage 36,000v. The matting is for use where a live switchboard can be worked on in safety and prevents live electricity grounding thereby preventing shocks and injury to your workforce. 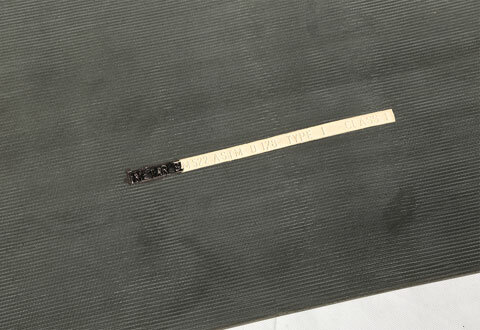 It is permanently labelled on the back of the rubber safety matting roll with the relevant classification information. 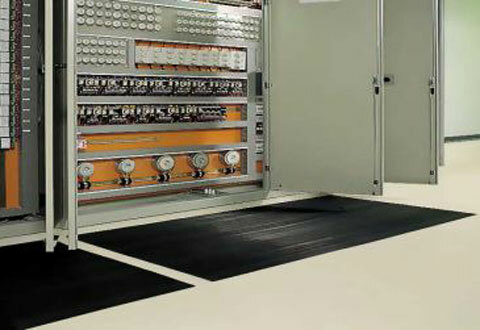 Electrosafe rubber switchboard safety matting is 450v general purpose electrical insulating floor matting. It is tested to 11Kv and has a 450v working voltage. It is a fully tested general-purpose electrical switchboard safety matting with the relevant product detail inlaid into the back of the roll to allow for simple identification on inspection of the matting. It is tested to 11,000v with a working voltage of 450 volts and is the most common electrical rubber mat and is suitable for all applications where the following applies:- 3 phase 415 volt switchboard panels with less than 11Kv working voltage. Available in 10m x 1m or 1.2m width rolls 6mm thick and can be custom cut to suit your requirements. 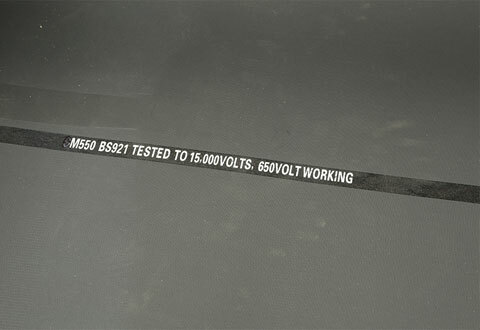 Electrosafe electrical switchboard matting (BS EN 921) is a 15kv tested 650v working voltage rubber grounding matting. 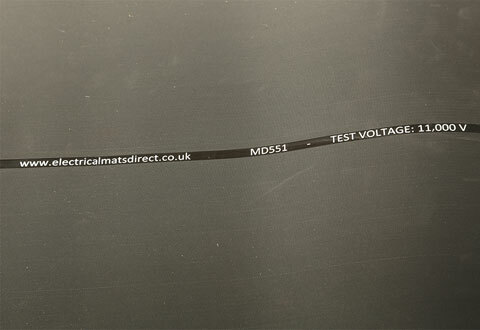 This electrical rubber grounding switchboard matting is fully tested in accordance with BS921/1976 British Standard. 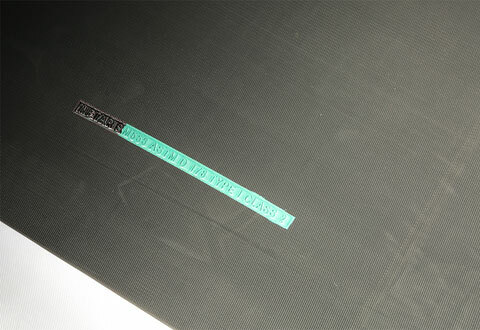 This robust 9.5mm mat has been the mainstay for switch rooms since 1954 and is fully labelled and stamped along with certificates of conformity to ensure a safe working mat. This specification has been superseded by the European IEC 61111 class 0 specification matting product. Available in 10m x 0.91m or 1m or 1.2m wide rolls and 9.5mm thick - and can be custom cut to suit your requirements. Electrosafe electrical switchboard matting (ASTM D178 Type 1 Class 1) are 20Kv tested and have a 7.5Kv working voltage. It is fully tested to the following: dielectric test 20,000v, surface proof test 10,000v, working voltage 7,500v. It is a black shock proof rubber matting made using the finest quality rubber compounds to ensure workers receive the best protection possible when working with live electricity. Available in 10m x 0.91m or 1.2m wide rolls and 4.5mm thick - and can be custom cut to suit your requirements. Test certificates and/or LOC will be supplied when ordering our electrical safety floor mats for your records to conform to H & S regulations. Electrosafe electrical switchboard matting (ASTM D178 Type 1 Class 2) are 30Kv tested and have a 17Kv working voltage. It is fully tested to the following: dielectric test 30,000v, surface proof test 20,000v, working voltage 17,000v. 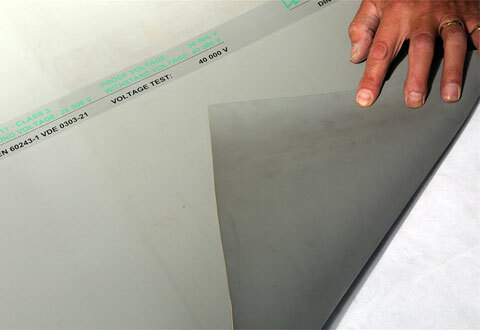 It is used for preventing injury to electricians during work carried out on high or low voltage electrical supply panels - an insulation mat needs to be provided to conform to current health & safety regulations. All letters of conformity and certificate are available upon request when ordering to guarantee authenticity of your purchase. Available in 10m x 0.91m or 1.2m wide rolls and 6.5mm thick - and can be custom cut to suit your requirements. Electrosafe electrical switchboard matting (ASTM D178 Type 1 Class 3) are 40Kv tested and have a 26Kv working voltage. It is fully tested to the following: dielectric test 40,000v, surface proof test 30,000v, working voltage 26,000v. This electrical switchboard safety rubber matting is required for insulating operatives from shocks when working on electrical equipment. All our electrical rubber floor matting rolls are supplied with all the relevant test certificates so you can be sure of guaranteed quality. Available in 10m x 0.91m widths and 9.5mm thick - and can be custom cut to suit your requirements. Electrosafe electrical switchboard matting (ASTM D178 Type 1 Class 4) are 40Kv tested and have a 26Kv working voltage. This heavy duty durable rubber safety matting is ideal for work in harsh high voltage grounding operational environments where safety is paramount when working on switchboard equipment and a grounding mat is vital. Available in 10m x 0.91m widths and 12.5mm thick - and can be custom cut to suit your requirements. All certificates can be requested when ordering these electrical safety mats. Electrosafe electrical switchboard matting (ASTM D178 Type 1 Class 5) are 20Kv tested and have a 7.5Kv working voltage. This Class 5 substation earth mat is a very high quality electrical earthing mat to ensure safety during operations on switchboard equipment. 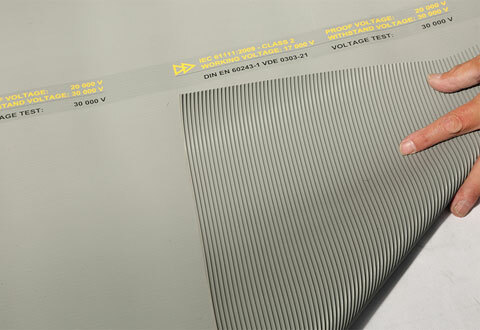 Available in 10m x 91cm rolls 4.5mm, 6.5mm & 10mm thicknesses - and can be custom cut to suit your requirements. 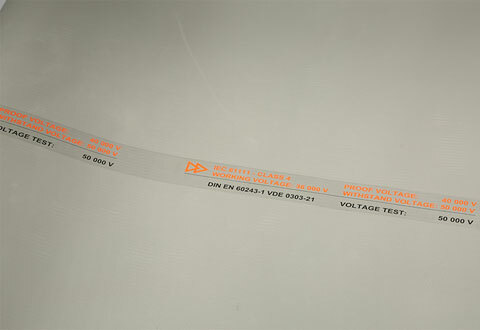 All relevant test certificates are available upon request during manufacture. 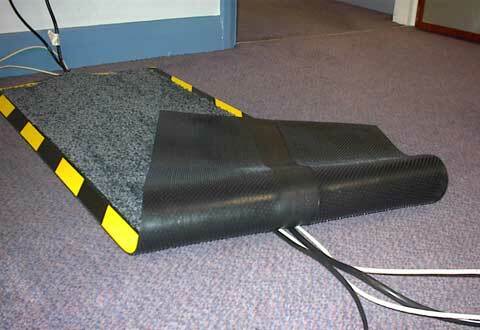 Cable floor safety mats cover trailing wires and cables in an open area for safety. This ensures a safe passage for personnel and help keep the floor area tidy. Just collect the wires together and lay them flat under the mat and they will be kept in place and reduce the risk of any tripping accidents. The mat can be run over with light weight trolleys without damage - and being manufactured from rubber will always ensure it will lay flat without a trip hazard being created. What is the difference between working, tested and dielectric voltage? Working voltage is the maximum that your switchboard is working to, whereas the tested voltage is what the matting will accept before failing and the dielectric voltage is what the matting has been tested to find its leakage parameters. When does and electrical safety mat need to be replaced? Generally when there is visual wear to the flutes on the matting or when the matting has been in use for a period of 5 years. © Mats Direct UK Ltd. Web Design and SEO Services by WebsitesNorthWest.